Conrad Poppenhusen (1818-1883), entrepreneur and philanthropist, was born in Hamburg, Germany on April 1, 1818. After working for a whalebone merchant as a whalebone purchaser in Europe, Poppenhusen moved to the United States in 1843 to set up a whalebone processing plant on the Brooklyn waterfront. In 1852 he obtained a license from Charles Goodyear to manufacture hard rubber goods, and then moved his firm to a farming village in what is now Queens. Poppenhusen is credited with creating the Village of College Point, which was formed in 1870 when it incorporated the neighborhoods of Flammersburg and Strattonport. In order to accommodate his factory workers he initiated numerous developments; including the establishment of housing, the First Reformed Church, and construction of streets.. In 1868, he opened the Flushing and North Side Railroad, which connected the town to New York City. 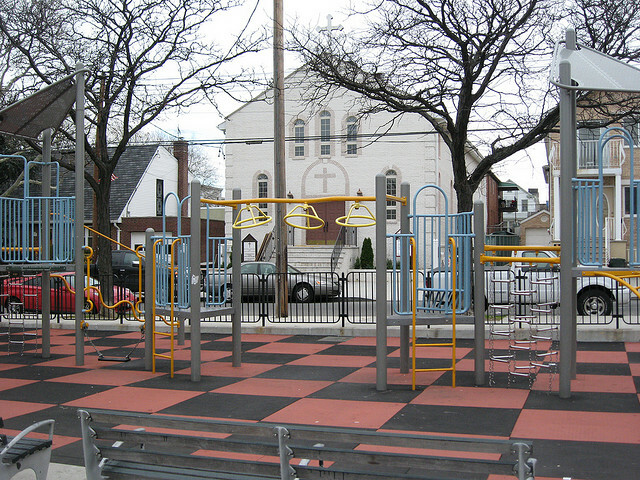 In that same year he also founded the Poppenhusen Institute, which was comprised of a vocational high school and the first free kindergarten in the United States, and is the oldest school in Queens today. After Poppenhusen retired in 1871, his family lost much of its fortune due to the financial mismanagement by his three sons. Conrad Poppenhusen died in College Point on December 12, 1883. This property, bounded by 20th Avenue, 123rd Street, 21st Avenue ,and 124th Street, was sold by Conrad and Caroline Poppenhusen to the Village of College Point for one dollar in 1870. It became the property of the City of New York when the five boroughs were consolidated on January 1, 1898. 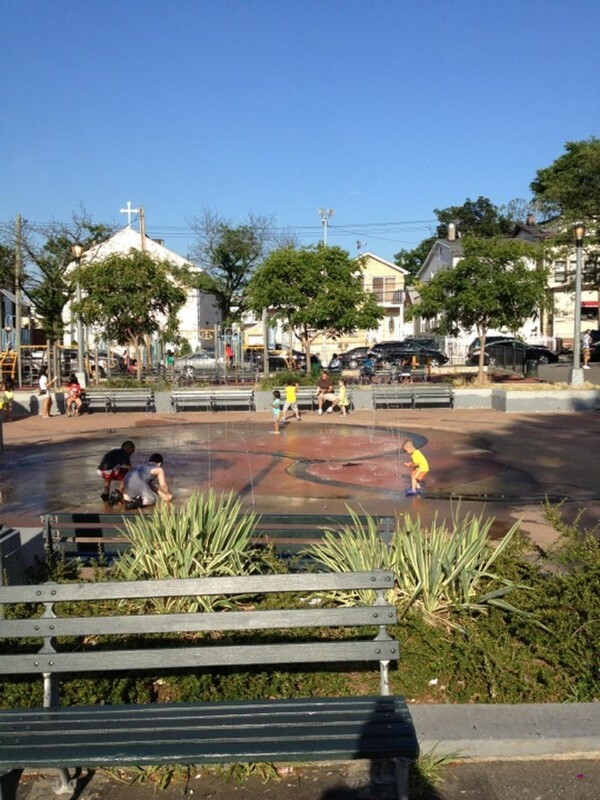 Originally called College Point Park, it was renamed Poppenhusen Playground in 1971 by the City Council. 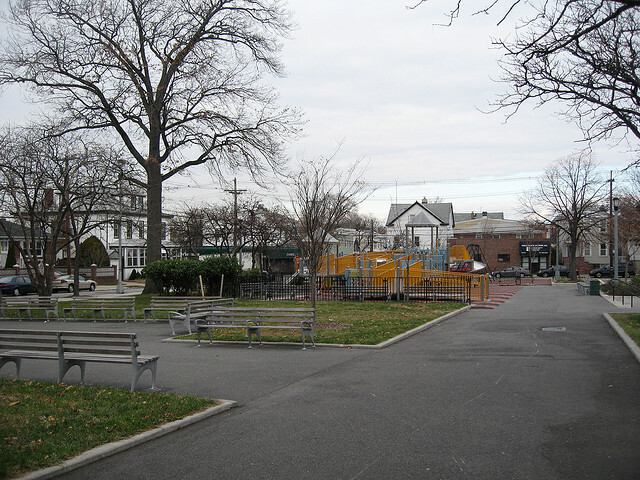 Poppenhusen Park, a triangle of flowerbeds at College Place, 122nd Street and 11th Avenue, was also given to the city by the Poppenhusens. It is the site of a bronze bust of Poppenhusen by Henry Barer, which was dedicated in 1884.